The Wall Ball singles kicked off the day at the World Championships on Monday, as Ireland’s top-seeded Conor McElduff advanced to the final with a clinical victory against New York’s Josef Gotsch, while Vlad Klym won the battle of New York in the bottom half of the draw, ousting Arthur Sayed to advance to the final. 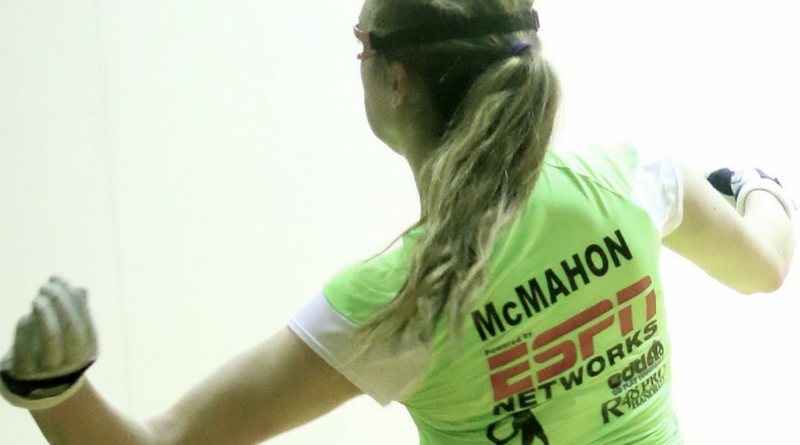 The women’s Wall Ball saw defending champion Danielle Daskalakis cruise past Ireland’s Fiona Tully to advance to the final, while Ireland’s sharp-shooting southpaw Martina McMahon advanced to the final in the bottom half, overcoming Spain’s Karen McConney. Former national champions Willie Polanco and Joe Kaplan will meet in Tuesday’s small ball 1-Wall finals, as Polanco cruised past Eric Lee in the upper bracket and Kaplan had little difficulty in sweeping rising 1-Wall star Steven Woo in the bottom bracket. The men’s 4-Wall open singles kicks off tomorrow with round of 32 action, while the Wall Ball events will conclude on Tuesday. Stay tuned to this thread for updates from each day in Minnesota. Ireland’s top two 1-Wallers Conor McElduff and Martina McMahon have advanced to the World Open Singles Finals after two excellent semi-final wins today. McElduff accounted for Josef Gotsch (USA) 21- 6, 21-12 while Martina McMahon saw off Karen McConney (T&T) 21-13, 21-3. McElduff now plays Vlad Klym (USA) in tomorrow’s final at 2pm local time (8pm Irish time). While McMahon plays the top seed Danielle Daskalakis (USA) at 11am tomorrow. The big guns enter the 4-Wall Championships tomorrow with reigning World Champion Paul Brady and Irish Team Captain Martin Mulkerrins plays Ricardo Fernandez Jr (Mex) and Jeff Strebig (USA) respectively.